Step back in time in this Great Summer Stone House, built c. 1868 on a Private Family Owned 40-acre Woodland Estate, up on a Bluff overlooking the Ocean and large Lawn below, with a 1/3 of a Mile of Shoreline, Tidal Pools, miles of Paths and Trails, an Apple Orchard, there is plenty to explore. Play Tennis on the Clay Tennis Court, swim from Rocky Shore below or walk to Public Beaches. Located just 2 miles outside of Downtown Manchester-by-the-Sea. It is easily accessible by Water, Train or Car. Great for Family Reunions with its 10 Bedrooms, 6 1/2 Baths, large Living Room, Dining Room, Study, Eat-in Kitchen with Dish Pantry, Pot Pantry, 2 Refigerators, 2 Dishwahsers, 5-Burner Stove, Cover Porch and upper Lawn overlooking Ocean and lower Lawn. Upstairs Play Room with Ping Pong Table and much history to explore within the walls, books and drawers of this Great Old Family Home. From the Manchester Historical Museum! "Sharksmouth was built in 1868 on 40+ acres fronting Dana’s Beach, a property formerly owned by Jacob Kitfield of Kettle Cove. The house was built for a prominent Boston family, General Greeley Stevenson Curtis and his wife, Harriot Appleton Curtis. The Curtis Family had been introduced to the dramatic Manchester coastline by friend Richard Henry Dana, the town’s first summer resident whose home was nearby. Architects for Sharksmouth were Ware and Von Brunt. The exterior is made of Rockport granite, the pink course is from Quincy, and the interior carved stairway was salvaged from the John Hancock House in Boston. They named their property Sharksmouth because of the distinctive rock formation at the edge of their waterfront property. Shortly after construction, the Curtis Family added a stable, barns, cottage and caretaker’s house, where Edward Payson Hooper resided for his 52 years of service. Orchards and gardens enhanced the property. In 1883 a third story was added to accommodate the growing family of five daughters and five sons. Daughter Elinor married the well-known painter Charles Hopkinson in 1903, and they built a house next door to Sharksmouth. Two other daughters, Harriot and Margaret, were pioneers in women’s golf, each winning a National Championship, and established the Curtis Cup Golf Tournament between the top amateur women golfers of the United States and Great Britain. Many famous guests have visited the estate, among them Henry Wadsworth Longfellow, John Singer Sergeant and the English astronomer, Sir Robert Ball. Sharksmouth is preserved by a trust to keep it for all the descendants of the family. It is occasionally rented for family reunions and special events. Find your own little piece of paradise among the 40 acres of private woodland and 1/3 mile of oceanfront. Explore here, there and everywhere! Built as a summer home during the Gilded Age ("Grand Houses & Gracious Living"), this house is perfect for Vacations, Family Reunions and special Events. Whether you need to just relax or work off some energy, there is lots to do or not do...Let the house and property speak for itself! Be in nature when taking a shower in this outside shower! Off of the master bedroom! Beautiful Cape Ann Golf Course just 15 minutes away. Whale watching, Antiques your desire, a ride down the Essex River, there is so much more just minutes away. Need a City fix...Boston is just 30 miles away, a easy train ride or hop on the highway. lower lawn, going to the beach, exploring the tidal pools, hiking through the woods here on the estate. 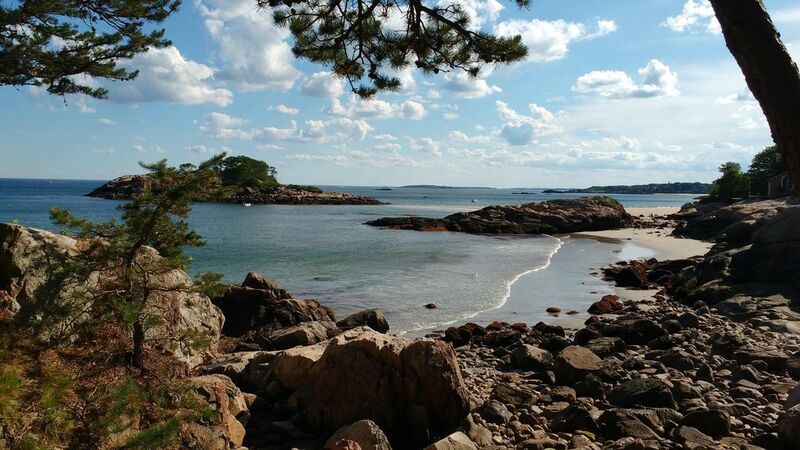 Cape Ann has many things to do - Whale Watching, Kayaking, Museums and Antiquing to name just a few.